I know it’s the end of the day and probably too late to make these if you wanted to. But who knows? Maybe you have a St. Patrick’s party to go to tomorrow. Or you could just pin these for next year. Because of my amazing time management skills I ended up throwing these together at the last minute. (Thank goodness I had frosting in the freezer!) 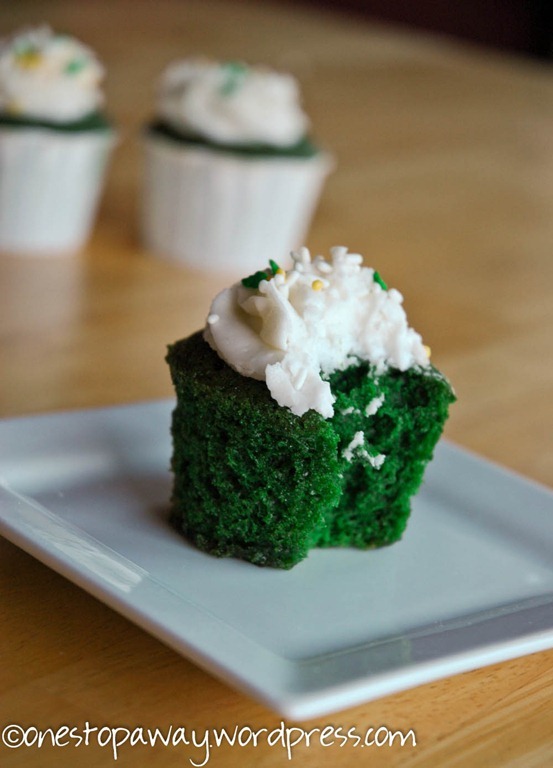 Do a search for Green Velvet Cupcakes, and you get a massive amount of results. The top picks were names I’d heard of but never followed or tried any of their recipes. As much as I would love to try some Hi-Hat/Dipped cupcakes, I simply didn’t have the time and decided to stick with a name I know and love: Bakerella. As I’m putting these together I realize I don’t have enough cupcake liners. No problem! I’ve had a couple packages of Wilton nut cups in my stash for a while just waiting for an opportunity to be used. They were easy to use and made handling and transporting a breeze. I thought they were delicious. My daughter thought they were delicious, but she might be biased. My husband (only slightly less biased) said, “They go good with coffee.” So there you go…pin them for later and enjoy! Preheat oven to 350 degrees. Prepare your muffin tins. Lightly whisk eggs in a medium bowl. Add remaining liquid ingredients and whisk together until blended. Set aside. Pour into prepared muffin cups. I had enough batter to make exactly 24 cupcakes. A cream cheese frosting would pair nicely with this, and Bakerella has one on her post. 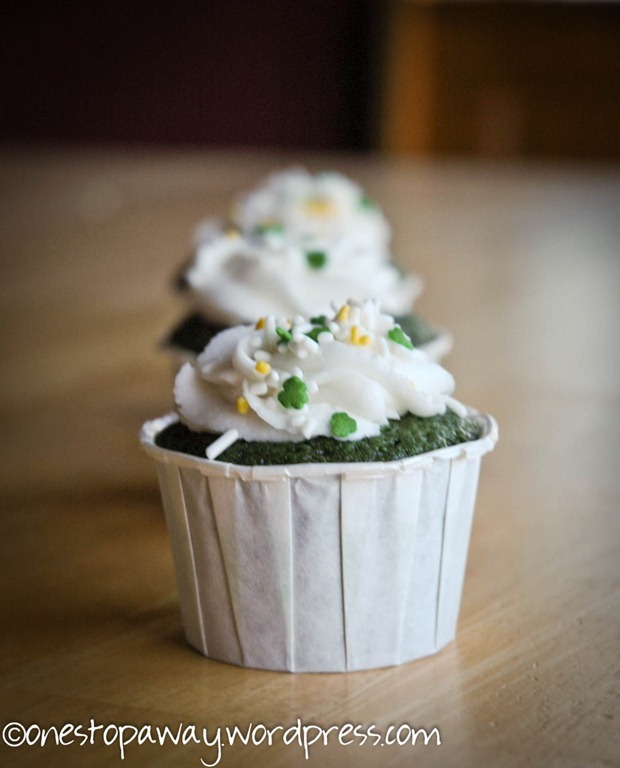 Since I needed them dairy free I stuck with my standard buttercream and topped them off with some shamrock sprinkles.